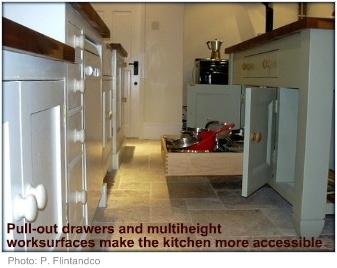 Designing and creating your wheelchair accessible kitchen benefits everyone. A lot of modifications that help disabled people to use a kitchen more easily also aid children and the elderly in the kitchen. 1. If you do not have an open plan kitchen then you may want to have the doorways widened so that a wheelchair can fit through it easily - about 90cm (around 36 in.) wide should be adequate. If this isn’t an option for you, then you may want to use swing away offset door hinges so that the door can be opened wider than 90 degrees. 2. Relocate light switches so that they can be reached easily from a seated position. With kitchen counters often in the way of light switches you may want the switch located outside the room just as you enter. 3. If you are planning a galley style kitchen, keep in mind that the minimum distance between facing cabinets should be 120cm (around 48in). For a U-shaped kitchen, or one with an island forming part of a U, the minimum distance increases to 150cm (around 59in). 1. Base cabinets can be unfitted and wheel-mounted. This allows a seamless look when they are in position, but also means that they can be pulled out of the way when a wheelchair needs to be brought up close to the countertop. An added benefit to this system is that the cabinet can be pulled close to where you are working - no more walking up and down the kitchen to get what you need. The top of the cabinet also functions as an additional, and lower, worktop. 2. If you have small high-set windows, consider mounting cabinets below them instead of above. These lower cabinets are a benefit to the elderly as they can access higher-up items without worrying about the weight of those items being too heavy to handle. 3. 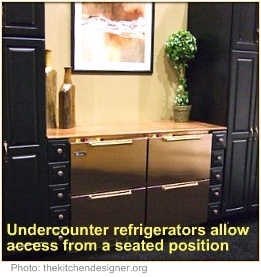 Pull-out type pantry cabinets are easier to access when seated. Just ensure that commonly used items are near the middle and bottom. 4. Pot drawers are a wonderful help to those who are using the kitchen from a seated position - you can get what you need without scrounging at the back of those cabinets. 5. Should you have an island in your wheelchair accessible kitchen consider having it wheel-mounted so that it becomes easy to move out of the way when necessary. 6. When packing your kitchen cupboards remember to put heavy items such as pots, and tinned foods at the bottom so no heavy item needs to be lifted overhead. 7. A lazy Susan inside the cabinet is great for getting hold of things without trouble. 8. Make the most out of your cabinets by using the inside of the doors for additional storage. You could use stick-on hooks for light-weight items such as a sieve or colander. You could also mount dispensers for paper towel, cling film or wax paper inside the door. 9. Use cup-pulls and leaver type door handles instead of door knobs as the former don’t require as much hand strength to work with. 10. Open shelves are very fashionable at the moment, and it’s just as well, as these provide readily reachable items in a wheelchair accessible kitchen. 1. Under counter refrigerator drawers are easy to use, eliminating hard to reach fridge shelves. These refrigerator drawers can be left as is, or also be fronted with a matching cabinet door for a seamless and integrated look. 2. Wall-mounted ovens and microwaves are more convenient than the traditional range cooker or under counter oven. 3. When appliances are installed make sure that the controls are near the front edge of the counter so that a seated person would not have to reach for them. 4. Lever type taps make for easier washing up. This task can be simplified even further by installing a long spray hose. 5. Consider installing an instant boiling water dispenser - much safer than working with a heavy and boiling hot kettle. 1. 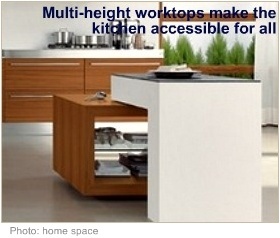 Use multi-height work surfaces so that both those in a wheelchair and those standing can use the kitchen with ease. Another option is to have a lower height kitchen table to work at if your counters are all a standard height. 2. If possible, install a grab rail along the length of the counter top so that family members with limited mobility or unsteady gait can negotiate the kitchen safely. 1. An angled mirror mounted above the stove is a simple way to allow a wheelchair-bound person to see how things are cooking. 2. 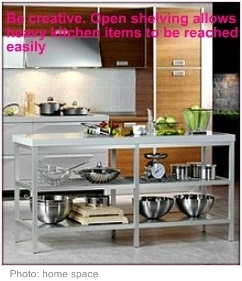 A light weight sturdy mobile cart is beneficial for conveying dishes and cutlery to and from the kitchen. I hope this helps you to get started on making an efficient and beautiful wheelchair accessible kitchen.